Cereal has found a place behind the bar, adding a sense of nostalgia to drinks. From Cheerios to Cinnamon Toast Crunch to Cocoa Puffs, breakfast cereals are coming to the bar, incorporated into a range of drinks by bartenders who enjoy the childhood nostalgia they can add to drinking occasions. The breakfast staples are being infused into spirits and syrups or mixed into a milk base to provide sweet flavors and a unique mouth feel to cocktails. While some venues offer them only during brunch hours, others are finding that consumers embrace cereal cocktails at all hours of the day. Wildhawk, a San Francisco cocktail haven owned by PlumpJack Hospitality Group, serves the Breakfast Negroni ($12), a fun iteration of the classic cocktail enhanced with Cocoa Puffs. Partner and bar star Jacques Bezuidenhout makes a pre-batched Negroni with Beefeater gin, Campari aperitif, Cinzano 1757 Rosso vermouth and house-made chocolate salt bitters, then macerates Cocoa Puffs cereal in it overnight for an extra flavor boost. 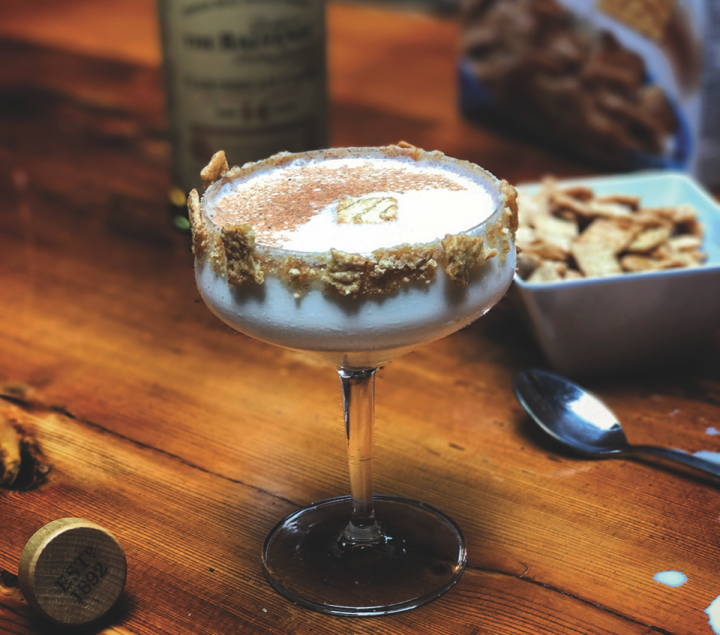 Indeed, cereal cocktails can be both sophisticated and fun. At the Kanu Lounge in Lake Placid, New York’s Whiteface Lodge, head mixologist Zachary Blair offers the General’s Breakfast ($15), blending The Balvenie 14-year-old Caribbean Cask single malt Scotch with maple syrup, lemon juice, egg white, sparkling water and Cinnamon Toast Crunch–enhanced milk, garnished with ground Cinnamon Toast Crunch. Blair says the cereal milk brings back childhood memories, but that the overall drink is refined because of the Scotch. “It takes you back in time, but through the adult lens of a cocktail,” he adds. Jessica Lambert, head bartender at Kimpton-owned restaurant and lounge Boleo in Chicago, makes a cereal milk that incorporates both almond and coconut milks infused with Corn Flakes for her Adulting Is Hard ($12) cocktail. She mixes the milk with Angostura 7-year-old rum, Mistral Nobel Extra Añejo Pisco, Emilio Lustau Don Nuno Dry Oloroso Sherry, Angostura Aromatic bitters, honey and lime. At upscale restaurant The Clocktower in New York City, general manager Stefan de Nooijer created the American Cereal Killer ($16), which combines Michter’s Small Batch U.S. 1 Bourbon, Angostura Aromatic bitters, vanilla syrup and Cheerios-infused milk. “Guests love it. It’s been one of our signature drinks since we opened,” de Nooijer says. "Cereal milk in drinks takes you back in time, but through the adult lens of a cocktail." Mike Jones, head bartender at Kimpton’s Sable Kitchen & Bar in Chicago, makes a Cheerios-infused simple syrup for his Cereal Circle ($14), which also comprises Copper & Kings Unaged Apple brandy, Yahara Bay Kirschwasser Cherry brandy, Emilio Lustau Palo Cortado Peninsula Solera Reserva Sherry and a whole egg. He says the cereal adds a nutty and earthy oat flavor, while the fruit-forward brandies elevate the overall drink. “I was trying to revisit that memory of eating a bowl of cereal and looking forward to the end of it when you can drink the sweetened milk that’s left behind,” Jones says. In Dallas, City Council Restaurant & Bar offers a different presentation for its cereal cocktails. During brunch, the venue serves a milk-based mixed drink with cereal on the side, encouraging customers to pour the alcohol-enhanced milk over the cereal, eat it and then drink the remaining milk. Variations include the Apple Jacks ($9), made with Stillhouse Apple Crisp whiskey, Bar Keep Baked Apple bitters, vanilla syrup and milk, served with a side of Apple Jacks, and the Fruity Pebbles ($9), blending Stillhouse Peach Tea whiskey, Fee Brothers Cherry bitters and Plum bitters, raspberry and vanilla syrups, and milk, served with a side of Fruity Pebbles.